On Friday morning, the intrepid traveler turned into quilt teacher. Dresden Plates of Distinction was the order of the day at The Artful Quilter shop. Ladies hedged their bets by bringing more than one fabric so they could choose the absolutely perfect one for their project. As a group, the quilt teacher felt that they were the quickest to actually cut into their fabric, rather than staring at it indecisively. It was a wonderful day and the ladies left with a knowledge of fussy cutting, hand piecing and a bit of hand applique. 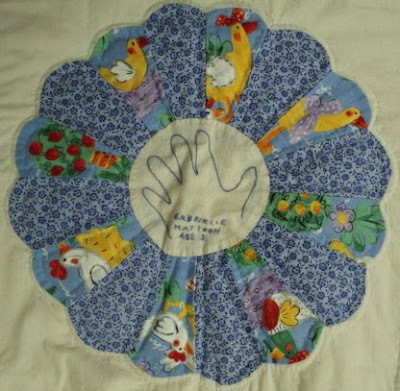 While teaching, the quilt teacher (hereinafter referred to as TQT) developed a sore throat and a bit of stuffiness. So on her way back to the hotel, she stopped at a mall to pick up some cold/sinus medicine. She had just gotten back to her room, when the room phone rang. Not knowing anyone who might call her on the regular phone, TQT hesitantly picked it up and said "Hello?" At the other end of the line was Eileen, a student from that day. She explained which fabric was hers so that TQT would be able to identify her (it was Day of the Dead fabric with skeleton newlyweds). TQT did remember her by name but the fabric reference sealed it! 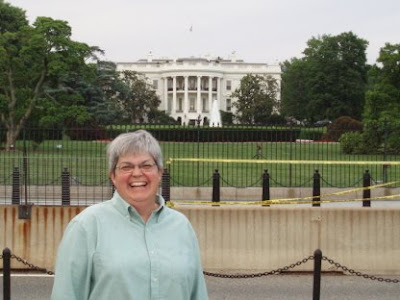 She said that she and her husband were just finishing dinner across the street from where TQT was staying and wanted to know if she'd like a tour of the Washington Monuments after dark! Having just lamented to herself on the way back to the hotel that she was so close to DC but having no faith that she and Lee would escape alive or any other way, she had just figured it was not going to happen. Then to get the call asking her! She sincerely hopes that she didn't quite shout YES. Grabbing her camera, TQT shot out the door to meet these most gracious tour guides. 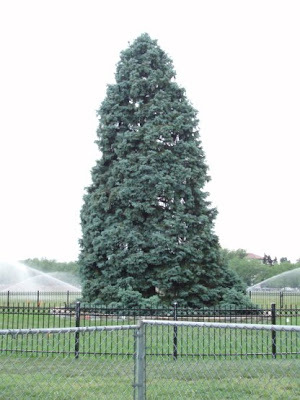 Here is the permanent Christmas tree that stands in front of the White House. Very tall! Sprinklers were on and aimed so that one had to time a quick run to avoid being soaked. Adding to the excitement of the evening. 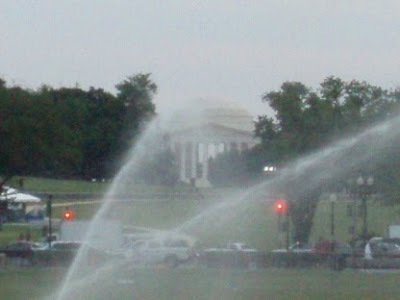 Through the sprinklers you can see the Jefferson Monument. 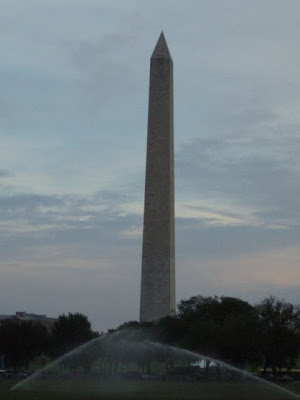 From the White House, our touring trio started for the George Washington Monument. It was just turning toward dusk, but the lighting had not started. After climbing to the base of the monument, there was a high alert for a breach of the base blocks. Selflessly, TQT threw herself against the bulging base to avert danger to others. With superhuman quilting strength (carrying those bags of supplies is not for nothing! 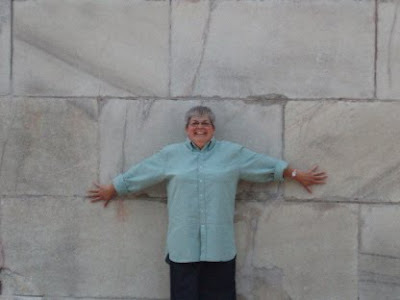 ), she was able to push the bulging blocks back into place, disaster avoided. And always wearing a smile! Stay tuned for Chapter 3, when more sights and sightings of TQT will magically appear! Off to I-81 South, gas tank full, Pepsi on ice in the cupholder and a book on CD in the player. All was progressing superbly until...EEEK! Just over the Pennsylvania border, a black bear (yes, Liza, I did say BEAR) ran across all four lanes of traffic and right in front of our startled traveler! Brakes were slammed on, bags flew to the floor and our wide-eyed traveler stared in amazement as the bear kept on going, over the edge of the road and down the bank. From 65 to 0 miles per hour in a verrrrrryyyy short time--good brakes, good Jeep! 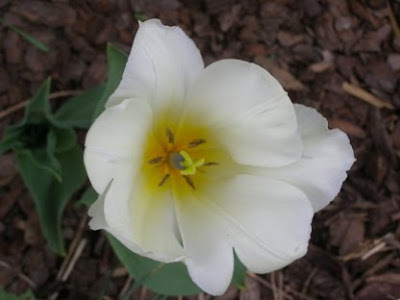 Shaking her head at the very thought of the bear (and realizing that it would not have made a good hood ornament and would have made a big difference in her arrival in Virginia), our traveler stepped on the gas and continued on her way. Alas and alack, the white knuckled traveler found the hotel and got checked in with time to shower and change before dinner and the lecture. Shall we say driving is a bit different than what is the usual at home? Bags were hauled up to the sixth floor of the hotel, calls home were made and our weary but happy traveler fell into bed with a sigh and no nightmares about the bear or the beltway. Stay tuned for part 2, complete with pictures! You won't believe what happens next! About three years ago, I was working a sale at Pucky Huddle Delight in Candor when a customer asked if anyone knew about Dresden Plates. Multiple fingers pointed at me and thus the story begins. 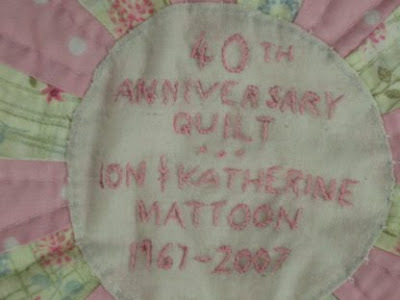 Katherine Mattoon had always dreamed of making a Dresden Plate quilt. Her 40th anniversary was approaching and she decided to see if she could make her dream a reality. Her family gathered, bringing scraps of fabric with them. 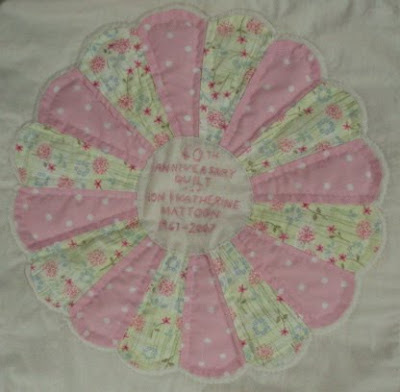 And even those who did not sew were able to hand piece the plates. Each person then signed the block and added a reference to a favorite Bible passage. Katherine did all the applique and hand embroidered the signatures and verse references. Every stitch, including the long seams to put the blocks together has been done by hand. A close-up of Katherine's block. 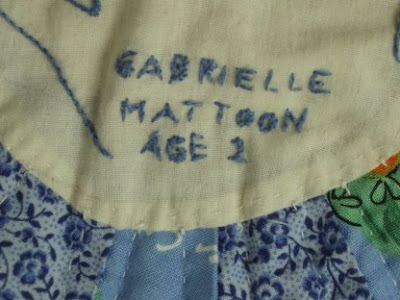 Her granddaughter, Gabrielle, got into the act--her hand was traced and stitched. And this is Gabrielle's mom's block. You just never know what will happen from one day to the next. Katherine brought the quilt to show me a couple weeks ago. What a wonderful surprise! Great job, Katherine! Here's to many more happy years of wedded bliss! For those of you waiting for your prizes--remember good things come to those who wait. I am hand piecing a bit of the prize and just have to sit and get to it. I hope to have some evening time this weekend to "git 'er done". Rest assured that I have not forgotten! Thanks to all who have commented recently. It's always good to know someone is out there! P.S. Just read The Checklist Manifesto by Atul Gawande. Excellent! (Non-fiction.) I am listening to Jonathan Kellerman's Flesh and Blood and just finished Dr. Death. This year Sharon G, Gale and I made our way to a new building (new to us)--the glass exhibit. 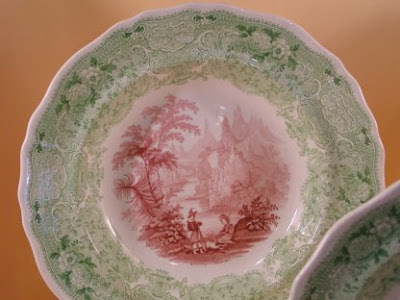 Extraordinary examples of decorative and useful plates. I was particularly enamored of this two tone plate--I had seen examples of all blue and all cranberry, but never two colors on the same plate. It just amazes me the amount of detail in some of the older stuff--not just plates. How did they do that? 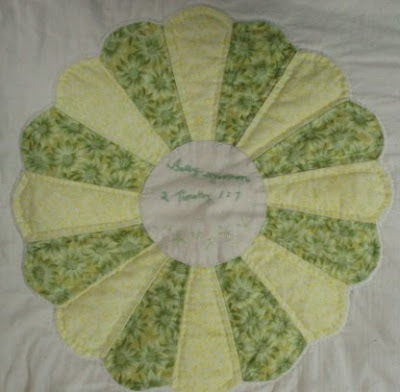 Had an excellent day--taught nine eager and talented ladies to hand quilt my way. We had a ton of fun and they did an exemplary job. Laughing and learning should always go hand-in-hand. Have a great Saturday night and a wonderful Sunday. Of all the birds, phoebes are my favorites. They are not brightly colored, but they can be sassy in spirit and usually return to the same nesting spots each year. 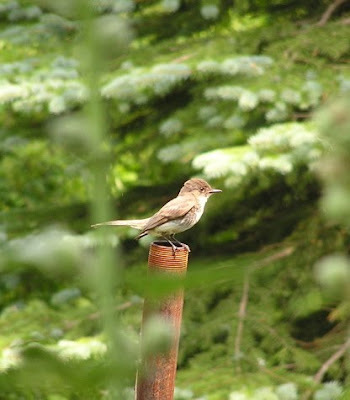 I am very lucky because several pairs nest just outside my sewing room windows. There is a small old shed at the corner of the lot that needs to be taken down. And every year I have good intentions of demolishing it--but the phoebes get here just before the weather gets good enough to work outside and they build nests over the door! I just cannot bear to destroy the nests--so I say I'll wait for nesting season to be over--then, of course, it is too hot and then the fall is busy and then--well, they must feel really secure that they will always have a home in the shed! The weekend is upon us again. I am working all weekend--but I hope each of you has a chance to sit back and enjoy whatever life brings you in the next day or two. 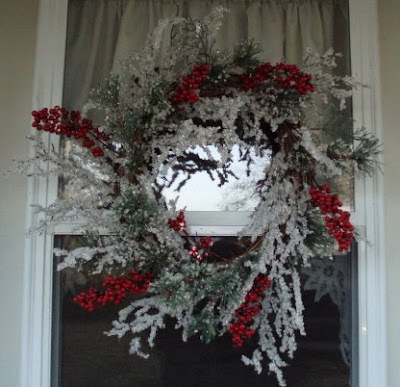 For several years I have had this beautiful wreath hanging on the side door during the winter. I don't have a comparable one for the other seasons and am often tempted to just leave it up year-round. That, however, became an issue in March of this year. Imagine my surprise when I stepped out the door one day on the way to class and found debris on the porch. At first I wasn't unduly upset--I do, after all, live in the country and lots of stuff finds its way onto the porch. I put the bags in the car and when I turned around, this is what I saw! 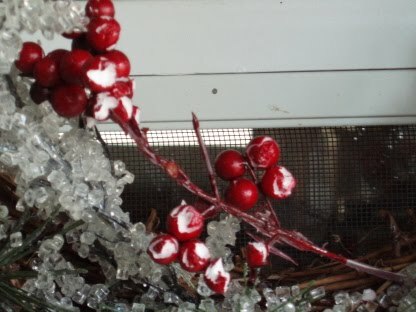 Birds, with apparently no taste, had been eating the plastic berries on the wreath! One taste was not enough to convince them that they were not real--oh, no, they had to keep trying. Maybe they thought the really tough, bland ones were just not ripe! 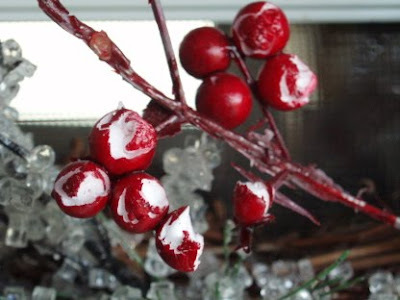 But they are the most perfect red berries ever, so let's keep trying! The clear stuff is fake ice, which they also found fascinating but strangely lacking in taste. I left the wreath up for several more days, hoping the vandalism would end, but...I had to take it down in self defense. A couple times I opened the door to find the birds on the wreath! I think they were house finches--likeable birds, quite nice under other circumstances. They are presently nesting on the back porch support beam. I do think the eating of the fake berries has taken a toll, because they seem to fly into the big window pretty consistently. In one instance the male did a real job on himself--it took several hours for him to regain his balance. The absolutely funniest part, though, was when his bride came down to see how he was and gave him several sharp pecks on the head! OUCH! I'm not sure that really helped. Hard to believe it is Thursday already. Carol, it was so much fun to read your comments! Don't be a stranger! After several people de-lurked and the regulars weighed in, how could I pick just one winner? So I have declared that everyone is a winner and will receive a prize. Now, don't get too excited--but I think you will be pleased. I will show the prizes after they have been mailed to continue the suspense! Now, I need addresses, please! Several of you I have--MAC, Janet, Jay, Cindy. For the rest of you, please email me at sharon@sharonstroud.com to give me your snail mail address. That way the information will be safe and not spread everywhere! I just hate that! On the horse front, I have ridden Electra again--and let's just say it was an adventure and leave it at that. Okay, I will say that I did not fall--yet. After I posted about cleaning the saddle, I bought a bridle! Can we say "undertow"? It still doesn't seem real to be working with horses again after all these years. But I am loving every minute! On the quilt front, I have almost finished quilting a small piece--would have had it done Saturday night but the power went out at 9 pm and never came back on until Monday at 12:30 am! The house was down to 48 degrees and Lynnie was wearing her outside coat inside! It was too dark to do any handwork, no electric to do pressing and/or machine work. So Lynnie, Callie and I huddled in bed reading by flashlight! I do have major basting to do before the weekend and before next week. At least I don't mind it. Okay, that's it for now. 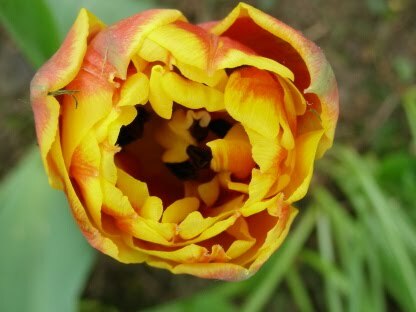 I'll try not to be such a stranger--every night I think about blogging, but then I think "it's late, I don't have much to say, I'll do it tomorrow." That's how it got to be May 11! I'll look forward to hearing from the winners!